VANCOUVER, Aug. 22, 2018 /CNW/ - Namaste Technologies Inc. ("Namaste" or the "Company") (TSXV: N) (FRANKFURT: M5BQ) (OTCMKTS: NXTTF) is pleased to announce that the Company has signed a wholesale supply agreement (the "Supply Agreement") with Manitoba-based ACMPR Licensed producer, Bonify Inc. ("Bonify"). Under the terms of the Supply Agreement, Namaste will purchase bulk cannabis products through the Company's wholly-owned subsidiary, Cannmart Inc. ("Cannmart"). Bonify operates a large-scale cultivation facility and will expand capacity to over 350,000 square-foot that will accommodate Namaste's growth trajectory. Namaste will work with Bonify to develop private-label strains of cannabis for the medical and recreational markets as well as in offering the full selection of Bonify products. Further to the Company's August 13th news release, Cannmart completed its Health Canada Pre-Sales inspection on July 31st, 2018 and the receipt of its "sales-only" license will represent a major milestone for the Company. With Cannmart's "sales-only" license imminent, and in order to accommodate the acceleration of NamasteMD's (NamasteMD.com) database and with the launch of Canadian recreational cannabis sales pending, the Supply Agreement with Bonify will guarantee adequate supply to support Namaste's demand. Namaste is also pleased to announce that it has registered over 14,000 users in its online patient portal and mobile app, NamasteMD representing a 130% increase in registered users in approximately 2 months. With the latest launch of the NamasetMD app, the Company has streamlined the on-boarding process, improved conversion rates and has opened the app's scheduling to accommodate appointments within 15 minutes from sign-up. The accelerated growth in patient acquisition which has taken place over the past two and a half months is extremely encouraging. Namaste anticipates seeing further acceleration once Cannmart's sales license is received and cannabis sales are integrated within the platform. The Company is also pleased with initial results from the launch of its patient feedback app, Uppy Strain Journal ("Uppy"), with over 11,000 downloads from its launch one month ago. Data collection through Uppy will drive machine learning algorithms that will be used in tandem with cannabis strain data to provide better strain recommendations for medical patients. By adding value for medical patients in an online environment, Namaste will achieve lower cost per patient acquisition, higher conversion rates, increased revenue and provide a better user experience. Namaste's e-commerce platform and technology will continue to drive innovation that will have a major impact on the way in which patients can access medical cannabis online. 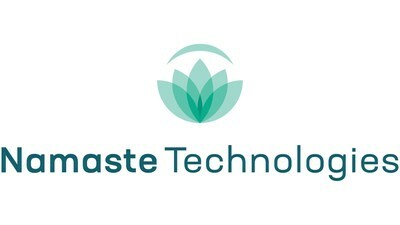 Namaste's goal is to create the most comprehensive user experience possible by personalizing product and strain recommendations through integration of its AI technology, providing convenient access to healthcare practitioners through its patient portal, NamasteMD, and to drive cannabis sales through Cannmart. Dalbir Bains, President and CEO of Bonify comments: "We are thrilled to be partnering with the leading cannabis technology company in Canada. We have witnessed firsthand the impact Namaste MD is having on patients by providing the most convenient and accessible health care experience regardless of whether you live in an urban or rural market thanks to its telehealth capabilities. The addition of Cannmart, which is coming shortly, will truly complete the patient experience from symptom to diagnosis, from a health care practioner, to receiving a product that will improve the quality of the patient's life. This aligns with Bonify's mission of improving the lives of our patients". Sean Dollinger, President and CEO of Namaste comments: "We're very excited to be working with Bonify and their team. I was personally on-site at their facility in Winnipeg and was very impressed with their operations and the quality of their products. Bonify will be a strong supply partner for Namaste as they understand our vision and have significant capacity to support our growing patient network. We're in a key position now where many of our efforts are coming together with our anticipated sales license at Cannmart. We're looking forward to expanding on our relationship with Bonify in the future and are very excited to be seeing all of these pieces now coming together. The Agreement with Bonify will ensure supply availability for Namaste during a period going in to recreational legalization where many producers anticipate a supply shortage. I'm very happy to see incredible results in our progress with NamasteMD and Uppy. These platforms will provide Namaste with long term value in domestic and international markets. We will continue to focus on developing our e-commerce platform to encompass everything cannabis. We're very excited for the future, looking forward to receiving our sales license soon and in rolling-out Cannmart's platform. We believe that Namaste will emerge as the dominant leader in cannabis e-commerce sales globally and have already established the infrastructure to achieve this goal."